After rereading my last post, I’ve been thinking a lot about what’s changed since then (and what hasn’t). The last time I updated this site was March (oof), a time when so many things in my life were ending and beginning all at once, when all I wanted was to stop the clock so I could remain in my second semester senior year bliss forever. At that point, I had no idea where I would be come September, and that uncertainty only added to my being scared out of my mind about where my life would take me in the coming year. Sitting here in my dorm room, I’m still scared, I guess. Scared about immediate things like my first ever finals week, scared for long-term things like the daunting task of finding my place, my way, in a university with a freshman class that’s many times the size of my entire high school. But I do feel like I’ve started to do that, that being here has made me look internally, listen to myself, in a way I’ve never really had to before; it’s forced me to think deeply about the kinds of people I want to surround myself with, and the types of things that matter most to me. College has also been stressful and mind bogglingly hectic and hard, of course. Without a kitchen (or much free time) I haven’t quite been able to figure out how to manage this blog as a full-time student, and while I’ve found other outlets and communities to funnel all of that excess creative energy into, it was comforting to return to the world of flour and sugar and butter over Thanksgiving break. I was nursing a craving for lentil soup and pita from my favorite Middle Eastern restaurant when the idea for this recipe came about. My mom and I would stop in there for a quick bite all the time when I was living at home, and every so often we’d get a little square of their basbousa with the check at the end of the meal. 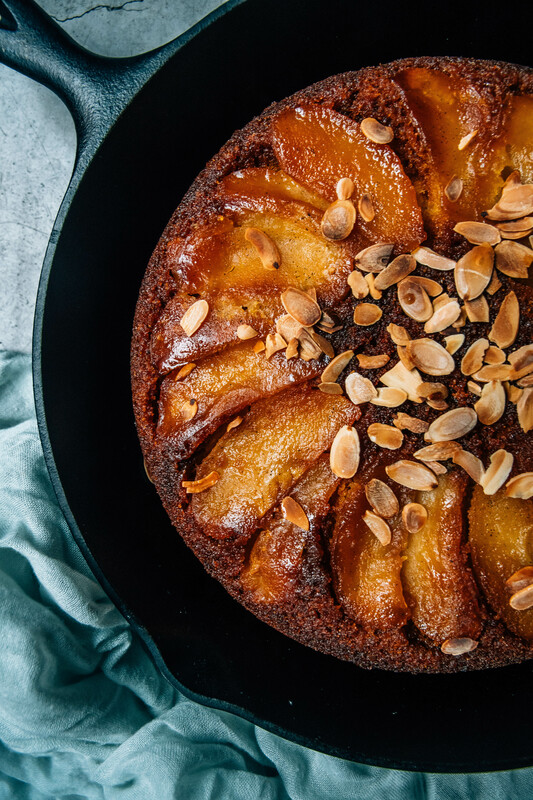 Basbousa, a semolina cake that gets drowned in the most wonderful syrup when it’s still piping hot, makes the perfect vehicle for sweet, soft apple slices and toasted almonds (which I burned the first time around, as per usual). I decided to caramelize my apples in the pan tarte tatin-style, then pour the batter right over top before sending the whole thing into the oven until it’s deep golden. I brought this to my grandparents’ house for Thanksgiving, and it paired perfectly with lightly sweetened whipped cream and a mug of tea (or good, strong coffee, which we had it with for breakfast the next morning). Begin by preparing the apples: In a heavy 10-inch oven-safe skillet, combine the scraped seeds of the vanilla bean and 1/4 cup of sugar. Cook on medium heat, stirring occasionally, until the sugar has melted and is beginning to caramelize. Add remaining 1/4 cup of sugar and cook until all of the sugar has dissolved and the mixture is a deep amber color (but keep a close eye on it and make sure it doesn’t burn). Stir in the butter and salt. Arrange the apples in the skillet, fanning them so they overlap slightly, and cook until they begin to let out their juices, just a few minutes. 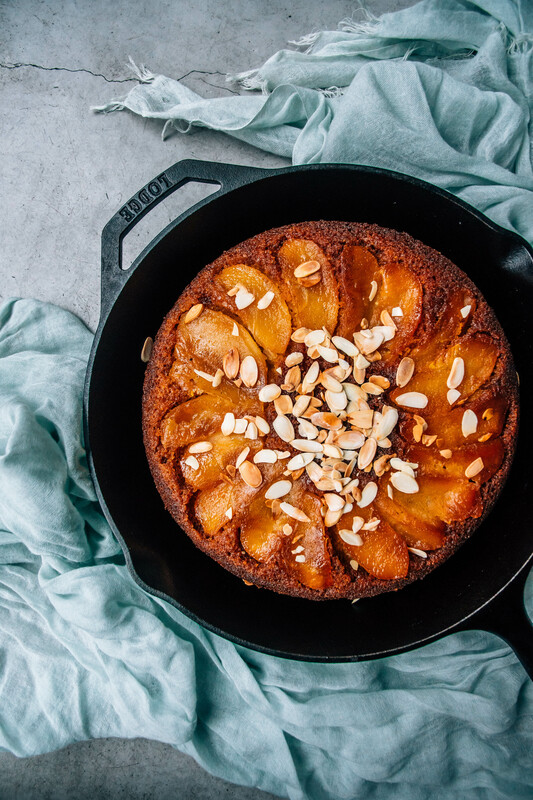 Turn off the heat and set the pan aside to cool slightly while you make the cake. For the basbousa: In a medium bowl, whisk together the semolina and baking soda. Set aside. In a large bowl or a stand mixer fitted with the paddle attachment, cream the butter and sugar until fluffy. Add in the eggs one at a time, and the vanilla extract. Gradually stir in the semolina mixture, then gradually add the yogurt, mixing until just combined after each addition. Grease the sides of the skillet with the apples in it with baking spray or oil, then spoon the batter on top of the apples. Spread into an even layer, then bake for 25-28 minutes, or until the cake is golden and relatively set to the touch (a toothpick should come out clean). While the cake bakes, make the syrup: In a small pot, combine the water, sugar and honey and boil until the sugar has dissolved. Set aside to cool while the cake bakes. Pour or spoon the syrup over the hot cake. It will seem like you have too much syrup, but the cake will absorb it! Cool for 10 minutes before inverting onto a serving platter. Cool completely, then top with toasted almonds and serve.